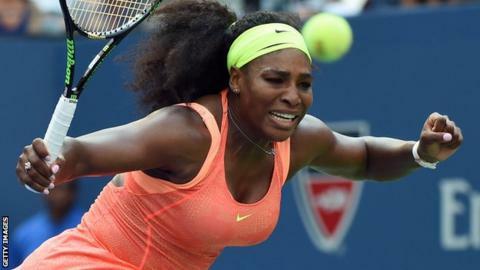 Serena Williams took another step towards her first calendar Grand Slam with victory over Kiki Bertens in the second round of the US Open. The world number one trailed 4-0 in the opening tie-break but came back to win 7-6 (7-5) 6-3 at Arthur Ashe Stadium. Top men's seed Novak Djokovic had little trouble overcoming Andreas Haider-Maurer 6-4 6-1 6-2. The Spaniard, who trailed 5-3 in the first-set tie-break and fell a break behind in both the second and third sets, admitted he had to fight for the victory. Elsewhere, defending champion Marin Cilic returned to Arthur Ashe Stadium for the first time since winning the title last year with a 6-2 6-3 7-5 win over Evgeny Donskoy. Grigor Dimitrov made another early Grand Slam exit as the 17th seed, a Wimbledon semi-finalist in 2014, was beaten 6-3 7-6 (7-2) 2-6 4-6 6-4 by Mikhail Kukushkin, the world number 56. Tenth seed Milos Raonic overcame a back problem to beat Fernando Verdasco 6-2 6-4 6-7 (5-7) 7-6 (7-1), women's 25th seed Eugenie Bouchard beat Polona Hercog 6-3 6-7 (2-7) 6-3, while Venus Williams saw off Irina Falconi 6-3 6-7 (2-7) 6-2. The scream after the first set and the grimace at the end of the match were evidence that Serena Williams was far from her best, but the 33-year-old is now five wins from her 22nd major title and the first calendar Slam in 27 years. Bertens, ranked 110th, took an early lead and served for the first set but could not convert, and the Dutch qualifier then let a 4-0 lead slip in the tie-break. Williams has spent much of her Grand Slam year fighting back from slow starts, however, and said afterwards: "It definitely doesn't worry me. I think being down a lot, I know I can try to make a comeback." The six-time US Open champion would end the match with 10 double faults, and 34 errors to 23 winners, and was just happy to get the job done in straight sets. "I've been really relaxed, but today I was a little tight and and I think it showed," she said. Eighth seed Nadal said winning the first set against Schwartzman, who is ranked 74 in the world, was crucial. "I feel lucky to be through. It was very humid and Diego was very aggressive so to take the first set was very important," said the two-time champion. But the Spaniard, who made 40 unforced errors during his match, was annoyed by questions about his recent decline. "I am number eight in the world. I am not number 100," said Nadal, who has failed to progress beyond the quarter-finals of this year's three other Grand Slams. "It seems like I am number 200 in every press conference. I am not so bad." Nadal's drop in the rankings means the 29-year-old could meet world number one Djokovic in the quarter-finals, and on current form the Serb would be favourite to win that contest. Djokovic took just 90 minutes to beat his Austrian opponent, but when the score was 4-4 in the first set it did not seem as if a win would come so easily. "I never played Andreas on a hard court so it took me a bit of time to get used to the positioning on the return," said Djokovic, who will next play Andreas Seppi. "From 4-4, I played really well." Dom Inglot made a superb start to the doubles as he and Sweden's Robert Lindsted beat second seeds Ivan Dodig and Marcelo Melo 7-6 (7-3) 5-7 6-4. "Come on!!!!!" wrote Inglot on Twitter. "A win against the 2nd seeds was just what we needed to get our campaign started @usopen. Blimey it was close though!" Wimbledon doubles finalists Jamie Murray and Australian John Peers made a comfortable start to their campaign. The pair beat American wildcards Bjorn Fratangelo and Dennis Novikov 6-3 6-2 on court 10. Murray and Peers, seeded eighth, were in the same half of the draw as top seeds Bob and Mike Bryan, who surprisingly lost to compatriots Steve Johnson and Sam Querrey 7-6 (7-4) 5-7 6-3. "You know, it never gets old. He's a true entertainer. Each year I see him in one of my matches, dancing, taking down the layers of T-shirts." Novak Djokovic joined professional super-fan Cameron Hughes in a post-match dad dance on court, before donning an 'I Love New York' top. "His mouth and his antics have taken over, and unfortunately you can't get anywhere being this way. His ability to play points was unbelievable against Murray, but doing that for a game or two isn't going to win you a match." Rod Laver talks to BBC Radio 5 live about Nick Kyrgios. "She was freaking out and rolling down her window, and screaming my name and was like, 'I love you.' I'm like, 'OK. Don't crash. Bye.'" Madison Keys on being recognised in the street. "I always have special outfits I feel like. I'll have to see what I got packed in my bag." You have been warned - Bethanie Mattek-Sands is ready to upstage Serena Williams when they meet on Friday. Mattek-Sands was amused at second-round opponent Coco Vandeweghe's racquet-smashing antics. "I was cracking up on the sideline there. I thought she was done and she just kept going," said Mattek-Sands. "I was like, go big or go home. You might as well destroy it.". Vandeweghe admitted: "I let it rip." "I'm excited to win two matches in a row, it's a while since I've done that." Eugenie Bouchard racks up back-to-back wins for the first time since March. Feliciano Lopez admitted the best man did not win as he beat the retiring Mardy Fish. "Fair to say you, Mardy Fish, were the better player today but tennis is crazy sometimes. Pleasure playing you today and always. The very best in your life," tweeted the Spaniard.